The World Players of Handball’s Race 4 Eight V just concluded its regular season with its sixth event in Salt Lake City. R48 pros competed in California, Arizona, Louisiana, Texas, New York, and Utah throughout the R48 V regular season, with just the R48 V Player’s Championship in Portland remaining. Paul Brady retained his #1 ranking with his fourth win of the season, while Sean Lenning maintained his slight edge over Mando Ortiz for the second spot after his runs to the finals at the Salt Lake City Aces. 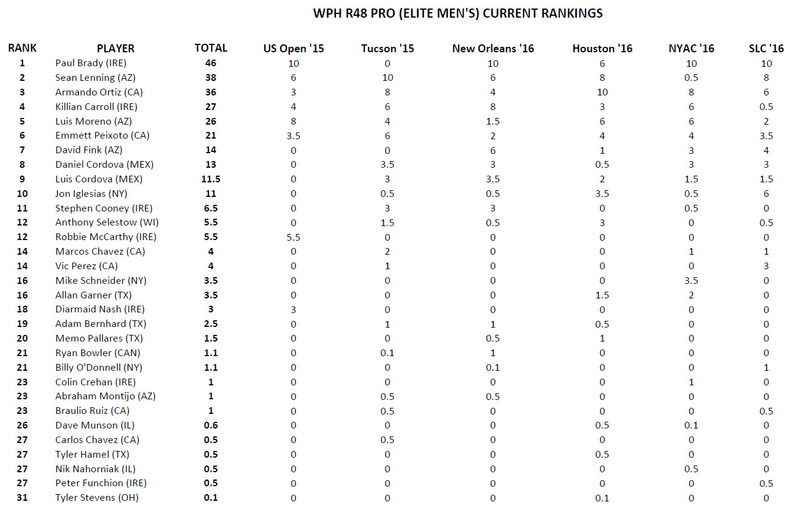 Killian Carroll and Luis Moreno flipped the fourth and fifth ranking spots following Salt Lake City, while David Fink and Daniel Cordova did the same in the seventh and eighth spots. The Race is on for the R48 V’s season-ending Elite 8, with players counting only their best five of seven stops following the Player’s Championship.